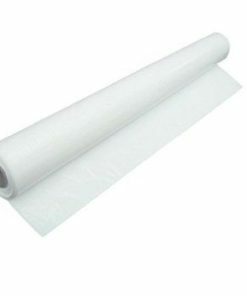 We have a selection of polythene sheeting available in different lengths and thicknesses ideal for working with asbestos removal. 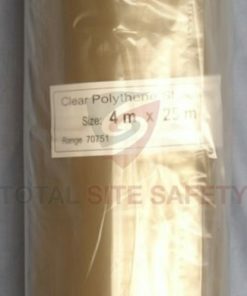 Part of our range of asbestos supplies, our polythene sheet rolls are available as rolls of 18m, 25m or 50m. 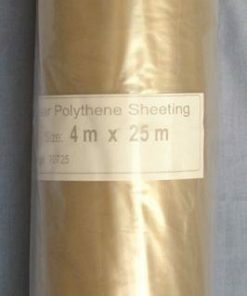 Choose from medium duty or heavy duty 1000 gauge polythene sheeting. 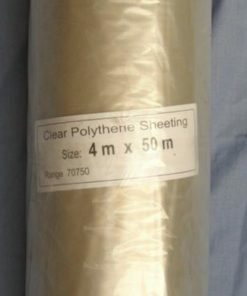 We mainly stock clear sheeting, but also have an orange flame retardant sheeting. Used by asbestos removal companies, Builders, Tradesmen and home owners performing DIY. Use our polythene sheet rolls to safely catch any falling debris and asbestos waste while carrying out asbestos removal. You will then need to place into large asbestos bags or asbestos waste sacks and dispose of at a dedicated asbestos waste facility. Your local council will be able to advise you of where this is. Need any help with your order? Call us on 0330 0885 675 and we’ll be very happy to help.